Portrait of eight young "Vikings" who have come to Madison to be named as Thomas E. Brittingham Viking Scholar students at the University of Wisconsin. 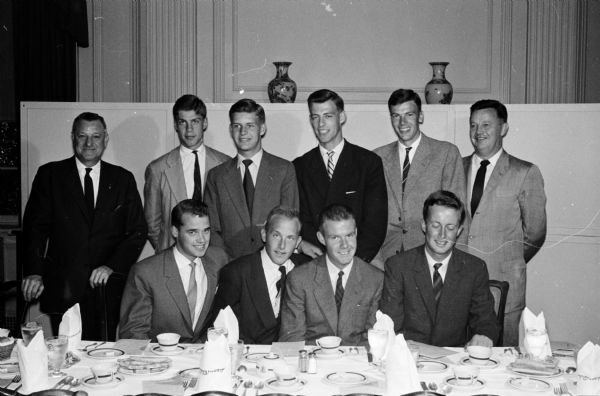 Seated left to right: Ralf Torngen, Helsinki, Finland; Helge Pedersen, Oslo, Norway; John Simonsen, Oslo and Frederik Eklof, Helsinki. Standing left to right: Bernhard Mautz, Madison; Staffan Berglund, Stockholm, Sweden; Niels Hoegh-Guldberg, Copenhagen, Denmark; Flemming Luttichau, Jutland, Denmark; Nils Frisk, Stockholm, Sweden and Henry Behnke, Madison. Thomas Brittingham Jr. died April 16, 1960. The Brittingham Scholars program, founded in 1953 continued through 1962. One of three images. Published in Wisconsin State Journal Sept. 9, 1958.